The WebSmart AT-FS750/24 features 24 10/100TX ports with 2 combo tri-speed copper/SFP ports for Gigabit connections. It is an ideal fit for small to mid-sized businesses. With the Web-based interface, you can set up 802.1Q VLANs to segregate traffic, QoS to prioritize mission-critical data such as voice or video packets and link aggregation to create traffic pipelines. 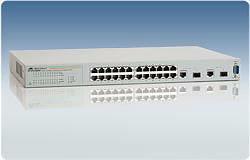 The AT-FS750/24 also provides network monitoring tools such as port mirroring and basic port statistics. Remote product management enables simple monitoring from anywhere.